The premise of the novel is quite unique considering the trend in young adult or women's fiction in the Philippines presently. It's something I haven't come across yet so I was excited to dive into the world Mina Esguerra created. 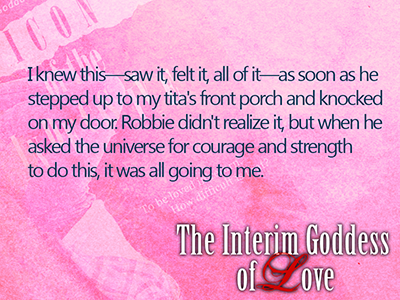 Initially I wasn't that sold on the idea of Hannah becoming the interim Goddess of Love. While it was interesting, I had a hard time grasping the whole concept of temporarily taking over for a goddess. I thought the beginning was a bit slow because readers were being eased into the story and I totally understand that. Hannah was still being trained by the Sun God a.k.a. Quin so there was a lot of things that I was eager to know but wasn't tackled just yet. As the story progressed though I was starting to understand what exactly Hannah was to do and how she was supposed to do it all. I also liked Hannah's voice. I thought she was a really relatable character. One thing that I didn't quite like about this book was the general direction of the story. Hannah had a mission to do or a 'project' as how she would put it, that much is obvious. But essentially I wasn't sure where the story was going. Would it just be a series of projects? Or is there a much bigger picture we're not seeing just yet? I was wee bit lost but not to the point where it bothered me. Knowing it's a trilogy, I let it slide because as far as first books go, this one's a good opening. The pacing was good, the plot was interesting and the author's new twist on Philippine mythology was refreshing. Overall an enjoyable book. If you've been feeling neglected by the Goddess of Love lately, don't worry -- Hannah Maquiling, college sophomore, is in training to take over. The Original Goddess is missing, but Hannah is Interim Goddess now, and she should figure out how to solve humanity's love problems soon. Quin (God of the Sun) is still her mentor, still really hot, but apparently isn't as honest about his other earthly relationships as she thought. It's frustrating, and enough to make her check out possibilities with Diego (God of the Sea) and Robbie (Cute Human). In the second installment Hannah learns to do new cool things with the help of her trainer the Sun God, Quin, and is flung into a messy goddess of love project involving her bestfriend, Sol. Now I won't dive into details about the project itself. All I can say is it's a huge step up from her project in the previous book. Here, Hannah can do so much more with her abilities and now she has to deal with something so much more than fixing someone's love life. The verdict? 4 stars. Mina Esguerra did great in building up from the previous book and did more to entice readers to check out the conclusion to the trilogy. 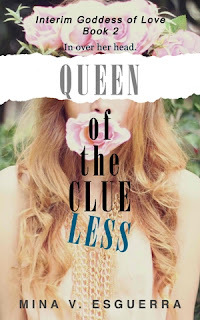 College student Hannah Maquiling, also temporarily working as the Goddess of Love, has had enough of everyone asking for her help when it comes to relationships. It's her turn to find romance! She deserves it, after serving as matchmaker and confidant to everyone else in Ford River College for the past year. She's had a crush on handsome senior (and God of the Sun) Quin forever, but he's destined to fall in love with an extraordinary mortal woman, so she's figured her chances with him have pretty much dropped to zero. It's not like she doesn't have any options for a classic college romance though. There's Diego, God of the Sea and Quin's best friend/enemy. And regular guy Robbie is stepping up, making sure she knows how he feels about her. How hard can it be for a goddess to find someone to love, and be loved in return? OH MY GODS, YOU GUYS. Where do I even begin? It's funny how at first I didn't really expect to rate any of the books higher than three (hey, I gotta be honest here) but with every book in the trilogy I was left wanting more. I guess that's just the magic that is Mina Esguerra's writing. 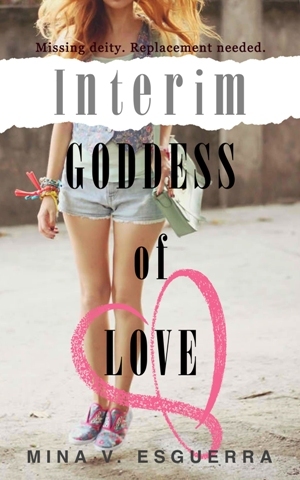 There are two big things that this book is about: Hannah's love life and her goddess duties. I just loved how Hannah's love life panned out! We got to meet Robbie in the previous books but here is where we really get to know him. And boy do I love him. Seriously. Robbie can go head-to-head with a lot of popular young/new adult book boyfriends and he'd come out victorious. Okay that's a tad bit dramatic but I'm all for drama because this book has so much of it. Yes, drama. You'd think things would be easier for Hannah, what with her powers and all that but it really isn't. Apparently, playing temporary Goddess of Love complicates your chances of falling in like. Robbie and Hannah's relationship was sweet and complicated but I liked it. Despite knowing everything that Robbie was going to do, Hannah was surprisingly cooperative. It's like she just allowed herself to be normal. I was half expecting her to just give up on making a relationship with a regular human work but she didn't. And that's one of the things that made her character all the more lovable. No unnecessary drama. She's simply uncomplicated. And Robbie.... oh yeah. Robbie. So adorable and cute. And in love. This may be the one time I choose the regular human over some paranormal being. The ONE time. How can you not?! We need more Robbies in the world. Please? Thank you. Now in the final installment, pieces of the puzzle are finally put together. I won't drop hints whatsoever because I want you all to get goosebumps, just like I did, when everything's uncovered. Hannah's dreams were finally given meaning to and everything that were vague before. Which goddess did the dreams belong to? Is the Original Goddess of Love ever coming back? What happens with Quin? And Robbie? (I'm getting goosebumps as I type this) All of that is answered here and I can't express fully just how AMAZING it was all tied together. Hannah's also a lot more kickass here so that's definitely a plus. Everything that transpired made me want to read the whole book all over again and write fan fiction for myself just to satiate this need for more. It's not that the story didn't satisfy me, because it did - so much, but there was room left for a lot of possibilities. And I think that's what the story leaves readers with - this attachment to all the characters. That's probably the reason why I'm still very much hungover this story. P.S. #TEAMROBBIE I'm calling out to the Goddess of Love, I need a Robbie in my life. Heeh. 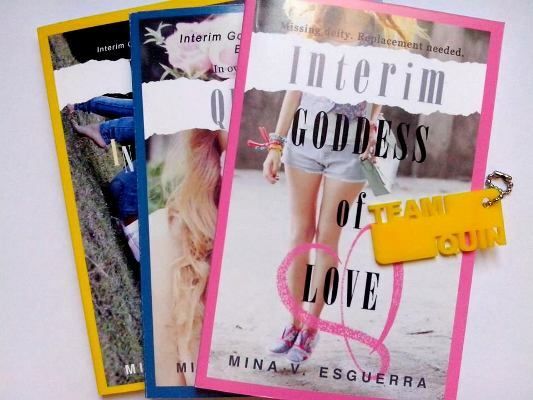 Mina V. Esguerra writes contemporary romance, young adult, and new adult novellas. Her young adult/fantasy trilogy Interim Goddess of Love is a college love story featuring gods from Philippine mythology. Her contemporary romance novella Fairy Tale Fail won the 2012 Filipino Readers' Choice award for Chick Lit. 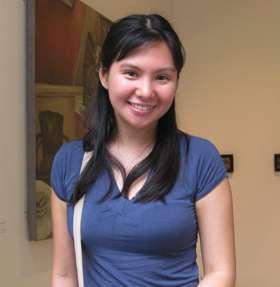 Through her blog Publishing in Pajamas (minavesguerra.com), she documents her experiments in e-publishing. When not writing romance, she is president of communications firm Bronze Age Media, development communication consultant, indie publisher, professional editor, wife, and mother. She created the workshop series "Author at Once" and #romanceclass for writers and publishers. or either a Team Quin, Team Robbie or Team Simon keychain (Philippine participants)! Sounds like a great book with all your gushing. :) Hope to win. BTW, is this book by a local author? Hope I win! Such a fan of Mina! a goddess power...hmmm...a power to control the clouds that would be soo... cool so fluffy! XD thanks for the giveaway! I don't know what power I would choose... time might be interesting. I could stop it so I had more reading time. ^.^ Thanks for the giveaway! If I would be goddess, I'd like to be the goddess of the Sea. I want to be a female version of Poseidon. I have the first book! I need to get on with this series!